Frederick McKinley Jones is the inventor of the refrigeration unit. He invented the first portable air-cooling unit, also referred to as the refrigeration unit. With his innovations, mobile refrigeration was improved for the long distance transport of medical supplies, food, and other perishable goods. Frederick McKinley Jones was born in Cincinnati, Ohio in late Spring of 1893. By the time he was 14 years old, he was able to work with automobiles as a naturally skilled mechanic. From there he continued to self-educate, read and study material that contributed to his natural mechanical ability and innovative mind. Jones continued to seek advancement and moved from Cincinnati to Hallock, Minnesota. He gained employment as a mechanic on a farm and eventually joined the U.S. Army during World War I. After his time in the military, he returned to Hallock as a mechanic. He continued self-educating, and with his natural mechanical ability he was able to grasp the intricacies of electronics. From what he learned he was able to build a transmitter for the towns radio station. During this period, Jones also invented a device that would revolutionize Cinema. He built a device that could finally combine sound with a motion picture. This actually caught the eye of Joseph A. Numero in Minneapolis, Minnesota. Jones began working for Numero in 1930, helping to improve the firm’s sound equipment. Jones continued to invent and expand his understanding of mechanics and electronics. In 1938, he designed the portable air-cooling units used on trucks carrying perishable goods. By 1940, he received a patent for it and Joseph A. Numero decided to sell his Cinema sound equipment firm in order to go into business with Jones. They formed a new company that specialized in refrigerated/cooling units. It became a multi-million dollar company by 1949 with the introduction of the refrigerated truck. The designs for the portable air-cooling unit were especially important during World War II. The cooling units were used to help transport perishable goods throughout the military hospitals and across the open battlefields. It helped to preserve food, maintain medicines, and other time-sensitive goods. Medical tents and army hospitals were able to receive blood for their patients. Those on the battlefield didn’t starve to death because they were able to receive supplies due to the portable air-cooling unit. Jones continued to invent, earning as many as 61 patents in his lifetime. The majority of his inventions was for refrigeration equipment, but his other inventions helped many industries. For instance, he received further patents for portable X-ray machines, improved audio/sound equipment, and more efficient gasoline engines. As an entrepreneur and inventor, it wasn’t long before he got the recognition he deserved. 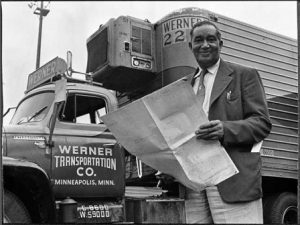 Frederick Mckinley Jones became the first African American to be included in the American Society of Refrigeration-Engineers by 1944. This led to more work in the 1950s, consulting for the U.S. DoD (department of defense) as well as the Bureau of Standards. Jones passed away in Minneapolis in the early Spring of 1961 after battling cancer. During his lifetime and well after his death, he continued getting the recognition he deserved. By 1977, he was included in Minnesota’s Inventors Hall of Fame. In 1991, his widow was awarded the National Medal of Technology on his behalf. Now known as the National Medal of Technology and Innovation, this medal is considered one of the highest honors awarded to citizens who made significant contributions to technological development. Jones was inducted into the National Inventors Hall of Fame in 2007 for his exceptional patents and work in the field of refrigeration. It’s hard to Image Life without Refrigerated trucks. Today, the refrigeration unit helps transport flowers, chocolates, meats, medical supplies and so much more. A refrigerated truck, also known as a reefer, can transport dairy products, frozen foods, even goods that require dual temperature settings during transport. Mobile refrigeration has continued to improve since its inception and delivering temperature and time-sensitive goods are made easier with a refrigerated truck, van, or trailer. ATC offers several types of refrigeration units to meet your distribution needs. Whether it’s a fleet or a single delivery van, our direct drive refrigeration systems perform continuously day after day, year after year. Your confidence is assured in knowing your fresh and frozen goods are safe, kept at perfect temperature by reliable ATC refrigeration units. Looking for an endorsed, Mercedes Benz Master Upfitter delivering quality engineered solutions for over 25 years. Do you have time or temperature sensitive products that need a proven, dependable refrigerated solution for your truck, van, or trailer? Need to ensure your delivery needs and business objectives are achieved? Advanced Temperature Control is the solution provider you need for all your transport refrigeration solutions. Contact ATC today the direct drive refrigeration specialist and we’ll show you how or locate the Dealer nearest you.